Small things make me inordinately happy. When I wake up in the middle of the night needing to pee, and I come back to bed with a feeling of perfect emptiness in my tummy and hours of sleep still ahead of me? Bliss. I am daunted by tall people. When I first meet someone lofty, I immediately assume they are highly capable, competent and intelligent. I’m not sure why this is. I know plenty of short people who are all of the above, and numerous tall people who tick none of those boxes. Yet, on first meeting, I instinctively defer to height. Once I get to know someone, I lose all sense of how short or tall, narrow or wide they are. But on first impressions, if you’re tall, you have me trumped. My earliest and best childhood friends were my brother and my chicken. We lived in a street full of Older Kids whom we weren’t really allowed to play with. So my brother and I mostly hung out together in our huge yard. The block of land itself was big, but it was even bigger in our imagination, because unknown to anybody but us, it was riddled with portals to other worlds, such as the pony farm that could be accessed by climbing to the very top of our she oak. 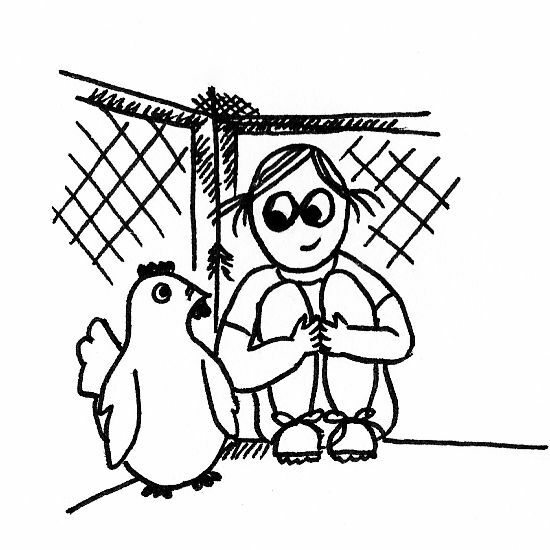 When I was feeling quieter and more contemplative, I’d sit in the chook cage alongside my hen, Tabitha, for what felt like hours at a time. It may only have been minutes though – she wasn’t a big talker, and the time passed slowly in silence. I am uncomfortable with mess, but I live in the clutches of Chaos. If the Good Fairy bestowed me with a whole week of nothing to do, I’d spend it decluttering my house. At the end of the purge, it would feel empty and happy. A bit like my bladder at midnight. If I eat out with a large group of people and one seat at the table is left empty, it will inevitably be next to me. This may simply be an unlucky coincidence, but at the time that it happens, I’m convinced it’s because I have appalling table manners and am painful to talk to. 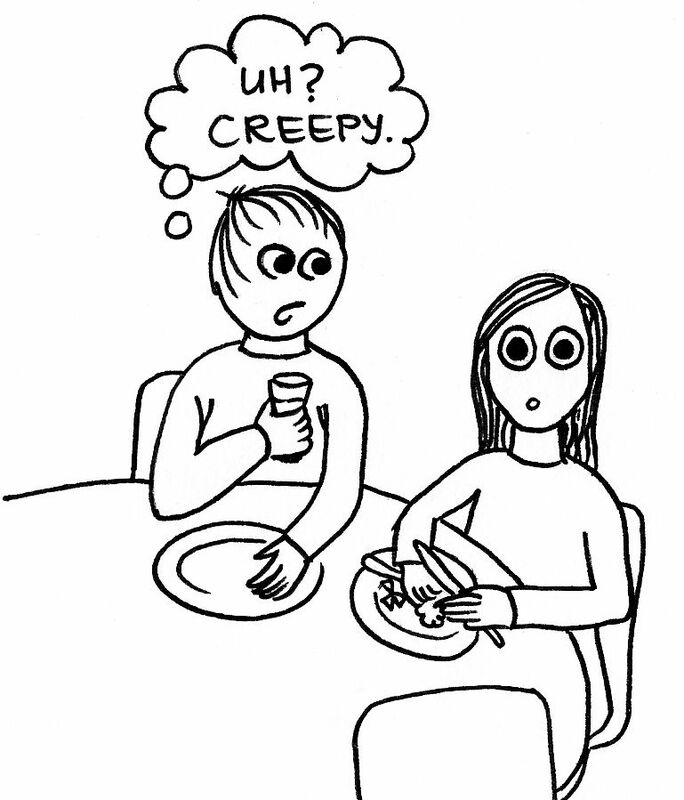 I often spend the meal trying not to make conversation with the one person sitting next to me, in case it leaves them feeling trapped. I take great caution not to spill or slurp as I eat, and I attempt to cultivate an appearance of zen-like contentment, signified by a slight smile and an unfocused gaze off into the middle distance. All of which probably increases the likelihood I’ll have an empty chair beside me next time around, too! My work history is dappled with unusual and unrelated jobs. I’ve been a cinema projectionist and a McDonald’s manager. I’ve interviewed a former justice of the High Court of Australia and driven a flower delivery van on Valentine’s Day. But my most lucrative gig was as a game show carry-over champ. I know that doesn’t sound like a real job, but over several stints lasting up to a couple of weeks, I brought home real money and bought real groceries with it. I even put it towards a deposit on a real house. People sometimes think my eclectic work history shows a lack of career-focus. I think it shows that I’m versatile and ingenious. These seven snippets of me come courtesy of the wonderful Imperfect Kitchen who nominated me for the Versatile Blogger Award. Unless you’re a blogger or my mum, this news probably excites you as much as scrubbing mildew off bathroom tiles with a toothbrush. So I won’t tell you anymore about it for now. Instead, I’m going to distract you with a cunning “Hey look over there!” tactic. Prepare to be amazed by my diversionary skills. Ready? The Imperfect Kitchen – sumptuous recipes paired with beautifully written vignettes. This blog is laden with wisdom, humour and longing. Jules at See Jules Travel – You don’t have to be a traveller to enjoy Jules’ writing. She has been everywhere, and she tells a cracking good yarn. So if you’re planning a trip and would like some insight into your destination, Jules has probably been there and written a story about it. And if you’re not planning to go anywhere, take the time one lazy afternoon to get lost in her vivid storytelling. The Great Unwashed – frank, funny and a little bit genius. Anna Cull in the Art Cave – Anna is a New Zealandish artist who showcases her art on her blog. She was my first real reader – the first complete stranger who stumbled upon my blog, liked it and kept coming back. Yay! for Anna. Yakinamac at Mrs Holder’s Legacy – diverse and thoughtful with a delicious sense of humour. Aysha at Think Plan Run – Aysha and her friend Emma are planning a charity run across Africa – from east coast to west starting in August 2014. Their blog is comprised of short, witty updates journalling their progress on the project. The Mathmaster at the Hungry Dog’s Lair – always surprising and interesting, but his post Fatherhood or something like it is one of my favourites. Tanny at the Fourth Continent – Tanny is a well-travelled Australian living in Greenland and sharing her insights, travel stories and stunning photos of the Arctic and more. Unless you want to know more about the Versatile Blogger Award, feel free to wander off now and visit some of those exciting blogs I just mentioned. For those of you who are still curious, here is what happened. The Imperfect Kitchen nominated me for this award, and to begin with, I was stumped about how to respond. I felt honoured that a writer I enjoy reading would give me a public thumbs up. And in the spirit of community, I wanted to pass on the encouragement to other bloggers doing good stuff. But I didn’t want to bore or baffle non-bloggers with my “Look, I got a gold sticker!” antics – I do tend to get carried away with peer approval. So I decided to do it a bit arse-about and leave the explanation till last. the quality of writing, the uniqueness of subjects covered, the level of love displayed in the words on the virtual page. Or, of course, the quality of the photographs and the level of love displayed in the taking of them. As you’ve probably noticed, I’ve broken all of the rules – not only by addressing them out of sequence, but by nominating seven bloggers instead of 15. The truth is I probably only read 20 blogs faithfully. Some of them don’t post very often or have quite a singular focus, and some of them already have a substantial following. So I left these ones off my list. To the seven bloggers I listed above (in addition to the Imperfect Kitchen): Tag, you’re it. I hereby nominate you for the Versatile Blogger Award. I really enjoy what you write and I hope the award introduces some new readers to the joys of your blog! This entry was posted in I was thinking..., The big bag of crazy and tagged award, blogs, drawing, Versatile Blogger, writing. Bookmark the permalink. Oh wow, I’m touched that you mentioned me. That is so very nice of you. The other blogs you noted seem very good. I’ll have to take some time to check them out. Congrats on winning an award. And great list of insights. Congratulations on the award, and thanks for the referrals to the great links!! Thank you, I blushed when I got your message! And now i have more interesting blogs to read … when I should be doing something else.